BELIZE CITY—Two Haitians who have been living and working in Brazil were busted at the Philip Goldson International Airport when they attempted to enter Belize on Tuesday with fake Belizean visas. 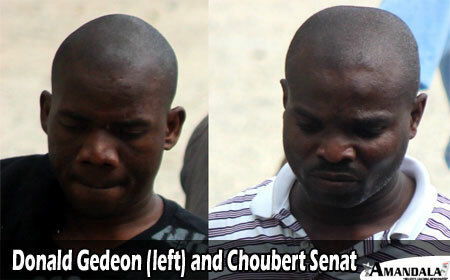 Donald Gedeon, 32, a Haitian national from Verettes, Haiti, and Choubert Senat, 36, from Port-Au- Prince, Haiti, were arraigned in the Belize City Magistrate’s Court on a charge of attempting to use a permit/visa not issued by a lawful authority. The men appeared before Magistrate Hettie Mae Stewart yesterday, Wednesday. Stewart did not impose a custodial sentence, but instead, fined them $2,000 plus $5 cost of court that she ordered them to pay forthwith. If they default on payment, they will have to serve one year in prison. Magistrate Stewart also signed a removal order for the men to be deported back to Haiti. According to a source at the Immigration Department, the men were unable to pay the fines yesterday. Our source confirmed that they will pay their fines today, Thursday. Our source also indicated that after they have paid the court fines, they will be put on the next available flight and deported back to Haiti. Court records indicate that Donald Gedeon attempted to use a permit/visa which was not issued by a lawful authority when he attempted to enter Belize with visa #V0000767370, purportedly issued on July 3, 2014, and which had an expiration date of October 4, 2014. The other accused man, Choubert Senat, was accused of attempting to use visa #V00076365, purportedly issued on July 3, 2014, and which had an expiration date of October 4, 2014. Both men admitted to immigration officers who interviewed them that they had bought the fake Belizean visas for US$500. According to authorities, both men arrived in Belize on the Avianca flight 414 from El Salvador with Haitian passports and attempted to enter Belize using the fake visas. They were observed to be lingering at the rear of the line when an immigration officer noticed them and asked them for their passports and disembarkation forms. The officer then observed that the forms were incomplete. Both men listed Belmopan as the address where they were heading in Belize. The forms, however, did not have a street name or house number. Upon closer inspection it was observed that the visas affixed in the passports were fake, because they were not convincingly similar to Belize visas and had none of the new security features that can be found on Belize visas. The only information that immigration officers were able to get from the two Haitians was that they had paid $500 US each for the visas. Immigration officers also found additional documents which showed that the men had been living and working in Brazil prior to coming to Belize. In court, the men, who were unrepresented, had to be provided with an interpreter who was fluent in French Creole. Mardochee Pierrre Sanon, a Belizean Haitian, was the court interpreter for the men during the court hearing.